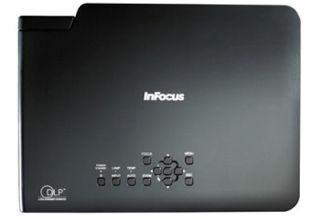 InFocus has announced the release of its Work Big IN15 notebook DLP projector, which is made specifically for the presentation-giving road warrior. Unlike the bulky devices of yore, it's small enough to fit in a bag alongside your laptop and weighs just 1.77kg. According to InFocus, the $1,499 (£721) IN15 is an evolutionary device that builds on the nicer features of its predecessor, the IN12. The IN15 is roughly 25 per cent brighter and is capable of displaying images at up to 2,500 lumens of brightness, which means it should still work well in rooms that aren't completely dark. The IN15 sports a native resolution of 1024 x 768 (XGA), but will scale video to 1280 x 1024 from computers, and can handle high-definition video up to 720p or 1080i. RCA, S-video, and VGA outputs are built-in alongside the projector's regular M1 port, which allows you to connect the device to some computers through a DVI adapter and to HD TV sources through component video. For added functionality, the IN15 comes with a wireless remote.